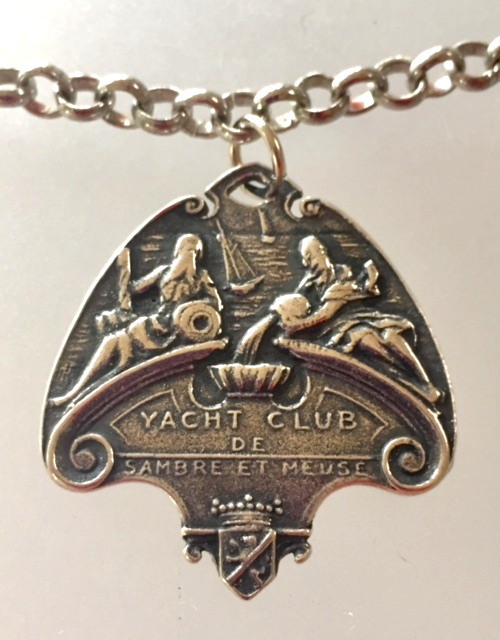 A powerful French Medal from an Art Nouveau Yacht Club cast from the original antique in sterling silverplate. It is extraordinary with a Lion and Crown Cartouche as awell as a Triton of the Sea!! Surely a handsome piece, especially if you are into yachting or boating! The Yacht clubs name is Sambre et Meuse, which has an interesting history. Sambre-et-Meuse was the name of a département of the First French Empire in present Belgium. It was named after the rivers Sambre and Meuse. Its capital was Namur. The département came into existence in 1795, when the Southern Netherlands were occupied by the French. It was formed from most of the county of Namur and parts of the bishopric of Liège and the duchies of Brabant and Luxembourg. After Napoleon was defeated in 1814, the département became part of the United Kingdom of the Netherlands. Its territory is presently divided over the Belgian provinces Namur and Luxembourg (a small part). Triton is a mythological Greek god, the messenger of the sea. He is the son of Poseidon and Amphitrite, god and goddess of the sea respectively, and is herald for his father. He is usually represented as a merman, having the upper body of a human and the tail of a fish, "sea-hued", according to Ovid "his shoulders barnacled with sea-shells". Necklace is 22" Long, Pendant is 1.25" by 1.25".